Stabilo once produced a fantastic watercolor crayon called "Tone." They stopped production of that product, but due to popular demand, Stabilo is now making a professional artist grade crayon called "Stabilo Woody." 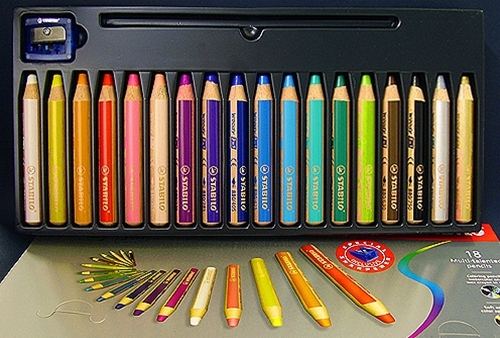 These are coloring pencils, watercolor crayons, and wax crayons all in one. They have thick, soft leads and incredibly rich color application. Colors are highly brilliant and retain their intensity, even on dark papers. 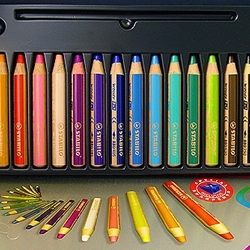 This special set includes 18 colors plus one sharpener that is specially made for this size of crayon. It is packaged in a convenient box with a slot for you to keep your favorite watercolor brush (not included in the set). Each crayon measures 4-3/8" long x 5/8" thick.